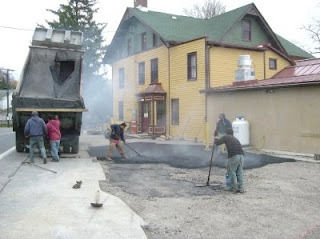 We had the area in front of the kitchen paved today, as this is where the handicapped parking spots are going to be, and they need to be on firm ground (the blacktop in this section had been crumbling for a long time). We could have done the entire front of the house, but we'd like to redo (at some point in the future) the rest with concrete or brick pavers, or something else appealing. 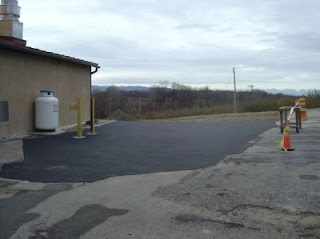 Nevertheless, the paved area turned out very nice, and we were very happy with the contractor. Whenever we have a contractor do work, not much else gets done. E! picked up the drywall, and we finished the ceiling in the Stube, and I did some prep work, so we can (finally) finish drywalling the Stube tomorrow.